Virginia's new exhibits and national memorials, battlefields and museums will renew passions for patriotism this Veterans Day. the most historic ground in America. Virginia's rich military traditions and iconic historical sites make the state a moving destination to honor those who fought for freedom. 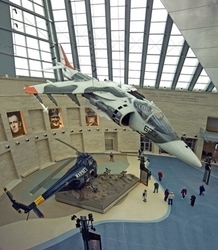 At http://www.Virginia.org/VeteransDay discover new exhibits and national memorials, battlefields and museums to renew passions for patriotism this Veterans Day. Arlington National Cemetery, an icon since its establishment during the Civil War, features the Tomb of the Unknowns. The tomb is guarded 24 hours a day, 365 days a year, with an elaborate changing of the guard ceremony every hour. In a sobering reminder of veterans' sacrifices, Arlington Cemetery conducts an average of 27 military burials each weekday. The Women in Military Service for America Memorial, located at Arlington Cemetery's ceremonial entrance, tells the personal stories of women's contributions to military combat from all eras and all branches of service. For a new take on the life and military career of George Washington, visit Mount Vernon Estate and Gardens. A massive new visitor center includes many personal belongings of George and Martha Washington not displayed previously together. In all, 500 artifacts fill the Donald W. Reynolds Education Center and the Ford Center. On Veterans Day, Mount Vernon admits free all active duty or military retirees. The new U.S. Marine Corps Museum, south from Mount Vernon via I-95, marks its one-year anniversary this Veterans Day weekend. The contemporary glass and steel-beamed structure resembles the Iwo Jima Memorial, located in Arlington, and tells first-hand stories of the U.S. Marine Corps, both past and present. On November 10, guests will enjoy birthday cake in honor of the museum's first anniversary. In Richmond, the American Civil War Center at Tredegar presents the story of the Civil War from three perspectives--Union, Confederate, and African American. The facility, which just marked its one-year anniversary, hugs the banks of the scenic James River within the ruins of Richmond's Confederate armory - known better to Civil War buffs as Tredegar Iron Works. Nearby is the Virginia War Memorial, which honors those who have been killed in action from WW II to present day. Richmond is also headquarters for Virginia Civil War Trails, which links 250 battlefields and museums through a series of driving trails across the state. Several of these sites are also included on the newly-named heritage corridor called the Journey through Hallowed Ground, recently recognized as "the most historic ground in America." Virginia tributes to "The Greatest Generation," -veterans of World War II, include the newly-renovated George C. Marshall Museum and Library in Lexington. Surrounded by the rich tradition of the Virginia Military Institute, the museum displays an interactive map of WWII, Marshall's Nobel Prize for Peace and outlines how The Marshall Plan rebuilt Europe after the war. The small town of Bedford is home to the National D-Day Memorial. Bedford lost more soldiers than any single town in America on D-Day. Three plazas tell the story of the allied invasion and victory in Normandy, France during WWII. Especially moving is the pool of water depicting the invasion scene, where sculptures portray soldiers struggling to reach the shore. On the east side of the state, Norfolk has an impressive museum dedicated to the lifetime achievements of World War II General Douglas MacArthur. A longtime resident of Norfolk, MacArthur's achievements in Korea and World War II are memorialized in galleries throughout several levels of the stately building's rotunda. Visitors can also experience life on a battleship aboard the Battleship Wisconsin at the U.S. Maritime Center. The state's Hampton Roads region is surrounded by military sites past and present. Home to active-duty military, the area also has many iconic historical sites -from Jamestown, to Yorktown, which commemorates the decisive battle of the Revolutionary War, to Fort Monroe that stood as a bastion of defense from Revolutionary times through the 19th century. The Virginia War Museum in Newport News offers $1 admission on Veterans Day, and the private Museum of Military History in Portsmouth invites visitors into a collection of personal wartime memorabilia. Visit http://www.Virginia.org/VeteransDay for a complete list of Virginia's military sites, memorials and special events honoring the passionate commitment of service men and women past and present.